So there we were, Sandy and I, mulling over all the frozen seafood options for Lent, when I just so happened to look over my shoulder at precisely the proper angle just as the crowds parted and harp chords played. It's as if it were meant to be. There it was, in big, bold, beautiful letters, with stylish packaging, just sitting on the shelf, waiting there, made for me and me only. I can only wish the lighting were a tad less fluorescent and a little more dramatic. Regardless, there it was, that delicious word, speculoos. There was no question that Trader Joe's Speculoos Cookies were an automatic purchase. Sandy and I are on an unfortunate cookie losing streak when it comes to comes to our favorite grocery store. It finally pushed us to the brink where we gave in and finally bought that crazy cookie butter all you kids are always, endlessly raving about. That's lived up to its billing (cookie butter + Nutella = ohmanohmanohmanohman!!!!). 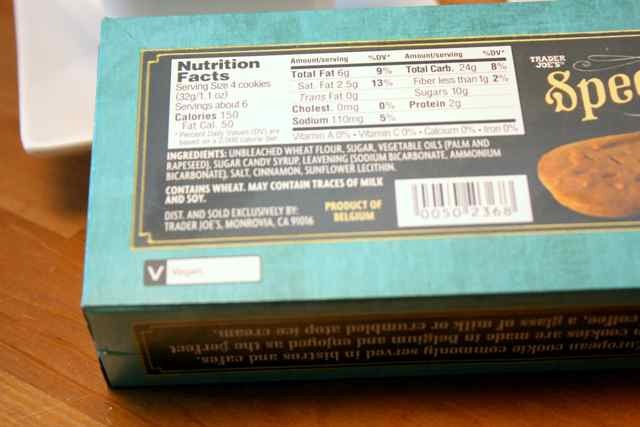 If these cookies were to somehow fail, I'd probably never buy cookies ever again. Well....we're not going to have to worry about that. Oh goodness. In my life I have somehow failed to enjoy the treasures that Biscoff cookies. I guess I've never flown Delta. Sandy has, though, and she ensures me these are pretty much exactly the same. I can only vouch that they taste just like the famed and renown cookie butter, except in crispy wafer form. If you know the cinnamony, gingerbready goodness of which I speak, then you know exactly what these taste like. Let there be no trace of disappointment. For that brief moment of peace and tranquility, hazelnut latte in the mug and these cookies in hand, it was as if Sandy and I were no longer in our teeny little house in the middle of Pittsburgh listening to Baby M snoring on the monitor with a load of laundry needing to be changed in the basement, but instead were transported to a European cafe on a cobblestone street, just the two of us with no other cares in the world. Okay, that's a bit of an overstatement, but not by too much. At first, the only ever-so-slight adjustment I'd say that I'd like if the texture were a tad more shortbread-like. But then I dunked mine in the hazelnut latte Sandy whipped up. Nope. Perfect. The crispiness was perfect and held up to the latte bath. There's nothing bad to say. Sandy's perfectly happy with them. When I asked for her opinion, she automatically said something to the effect of "Five. No question. Five." Whatever she actually said kinda got lost in our collective satisfied Mmms. I'm trying to come up with something, anything that can keep me from giving these a five as well. I can't. Too darn good. Well done, Trader Joe's, well done. is there one with you guys too?? Saw these and the word Speculoos threw me... made me want to not even pick up the box, well after reading, I shall give them a try... actually the hazelnut latte is what got me! lol..btw our tj's has tons of that Wintry Blend coffee. so if u are dying to try it send me your email..
Yeah, why did they get rid of the bistro biscuits anyway? The name, Speculoos threw me too. I didn't bother picking it up. You guys! I'm so happy your blog exists -- thank you! I've heard of Trader Joe's for years but the nearest store is 20 minutes away from our place so it was never all that convenient, but this past weekend my husband and I made the trip and we purchased tons and tons of great things (very few misses). It was totally worth the trip! Your site is definitely going to help us pick and choose what goes in our buggy on our next trip. Keep up the great reviews! I love the speculoos cookie butter too! I eat it with a banana in the morning. Thanks for the heads up about the cookies! I just discovered these and they are indeed lovely. Even my cat likes them! These cookies are even better when made into a sandwich surrounding cookie butter! So these are Biscoff cookies. Speculoos is the brand name in French speaking countries in Europe. 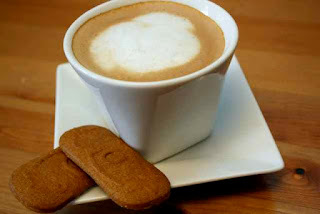 The company started the name Biscoff when it decided to market them in the US (biscuit + coffee = Biscoff). So this is another great TJ private label. I wonder if the price is more or less than Biscoff which you can even get at Walmart now. Another GREAT private label cookie I just discovered yesterday at TJs...Trader Jacques Coconut Cookies. To die for! These are made by the Bonne Maman company which makes great products. Discovered them in France last year and devoured them on my travels.